Highly Recommended Restaurants: Augustine’s, The Silk Purse, Raymond’s (Midleton), Fenn’s Quay, Over the Moon (Skibbereen), Aherne’s (Youghal), Liberty Grill. Top Cheeses: Ardrahan, St Gall (Fermoy), Hegarty’s Mature Cheddar, Sunview Goats . Looney’s, with their butcher business and the chipper, have been part and parcel of life in Mayfield for decades. They are obviously providing a great service in the area. If there is one product they excel in then it has to be their mince meat which is the best around. Service is always friendly and chatty. My poor Rosemary was a victim of the hard winter and but it took me a while to write off her chances of a full recovery. That decision out of the way, I headed to Swantons Plants at the Ballincollig Farmers Market to get a replacement. Told the man on duty my tale of woe and we concluded that the effects of the prolonged winter on plant-life were much the same as those of the banking collapse on business life. The market is held in a lane between modern buildings, quite a few of them empty. “I’ve been trading here a year, “ said the man from Swantons. “And not one new shop has opened.” Swantons’ main business is in Skibbereen and they are also regulars at the market there. I had bought some parsley and sage on an earlier visit and added just a pot of thyme to the rosemary. The herbs by the way cost a very reasonable two euro each. The stock though goes away beyond herbs and you can buy all kinds of flowers and small plants there and get a bit of home-spun philosophy as well. O'Sullivan Poultry in the English Market have everything you might expect in such an establishment. But now they have added some unusual meats as well: Ostrich, Kangaroo, Crocodile, Rabbit, Pigeon and so on. I was on the “hunt” for venison the other day and they had some from Tipperary in stock. A neat packet, costing less than four euro, caught my eye. Was surprised that it held more than enough for two. Took it home and had ourselves a delightful venison casserole that evening. Easy and not at all costly. Barry’s Tea, founded over one hundred years ago, is one of Cork’s iconic firms, well known nationally. It is served in many top class restaurants, currently advertised by Fenn’s Quay as part of the Dine in Cork week. Their Original, Classic and Gold Blends are, well, classics of the Irish Tea scene. But the folks at Kinsale don't stand still. New packs, especially the Green Tea range and also the Decaf, are doing well as I can see around this house. And now there are even newer products on the shelves of your local supermarket. One of these is known as Pu-erh. This is from China and is rich in anti-oxidants. And you also have, from South Africa, an herbal tea called Rooibos. It is naturally caffeine free and, like black tea, can be used with milk. So there you are, two new possibilities from our old friends in the Kinsale Road. At first glance, Cork’s Butter Museum mightn’t seem like much of an attraction. But, considering, that most of us (or at least most of our parents) came from the countryside and that virtually all of us use butter, it makes it worth the effort. For over one hundred years, Cork was a major player in the international butter market and the story is told by way of artefacts, audio-visual aids plus maps and other documents. There is even a container of bog butter, over a thousand years old! You will also see old style butter making equipment and other types of containers such as the famous firkin. The firkin was a measure of weight and that weight was checked on a crane, hence the nearby round building called the Firkin Crane (now a dance academy). Those of you of a certain age will remember getting loose butter in the English Market, the stall holder cutting the pound from a slab and tapping it into shape with a pair of small wood paddles (also on display). There are a few video points around the two story display (the visit costs just four euro for an adult) and the one I liked best showed the butter being made in a demonstration for the RTE programme The Butter Road. The butter road doesn't sound all that exciting but remember it took a week or so to complete the round trip from Killarney to Shandon and then you had the highwaymen ready to relieve you of your earnings on the way back. Cork, which had introduced a before-its-time system of quality control, eventually ran out of steam and began to lose out to other countries and butter making technologies. Irish butter ended up being sold unbranded and very cheaply in the UK until the 1960s when a national marketing effort put the product right back where it belonged and at a proper price. Joining the EEC also helped and you can see that story, the Kerrygold story, on video here. Butter is part of what we are and you’ll understand it all a little better after an hour or so at this pleasant place in Shandon. Actually, before I finish, I must mention the gentleman that we met there yesterday. He sold us our tickets but didn’t leave it at that. He came in a few times to see how we were doing and added his own considerable knowledge to make it a very enjoyable visit indeed. Well done to all involved and I hope that many visitors take the short trip up from the city centre to the Butter Museum this summer and that many locals, city and county folk alike, do likewise. Photos, from the top: A firkin, churns, butter-maker and spade, an informative poster. Called into the Franciscan Well Brew Pub over the weekend. You know this is a different sort of pub when you see the three big vats behind the counter and a group of fifteen fellows coming in to start the tour. But, micro-brewery or no, it is still a pub, a fine spacious one at that, with a very friendly and helpful service. If you are wondering which of the many beers you should taste on draught then you’ll get a little sample to help you make up your mind. Leaving the Friar Weisse, the Rebel Red and the Shandon Stout aside, at least for this visit, I went for the Blarney Blond. This lager is an excellent drink and a pint and half cost about €6.45 which is more or less the normal lager price. Well worth a try if you are a lager drinker. As the bar is a magnet for tourists, there is also a large selection of international beers available (though no Heineken or Carlsberg or Guinness or Murphy’s, nothing form the big name brewers). But you won't miss them. I’m beginning to liking for Czech lagers. They didn’t have Staropramen and, from the selection offered by the very helpful Polish bar-person, I choose the 1795 Budejovicky Pivo. A 50cl bottle cost me €4.80. This is a terrific drink, even better then the Staro, and I’ll certainly be looking out for it in the future, especially if I’m passing Bradleys in North Main Street. The Franciscan Well is nicely laid out and has a covered Beer Garden. They also do various Beer fests, seasonal barbeques, live music, tours and tastings and also supply Party Kegs. See their website www.franciscanwellbrewery.com or ring 021 4210130. At the Silk Purse last night. Ate some great food and met some nice people. The people bit started with the phone call to make the reservation. Roughly like this.. The Silk Purse website, http://themeatcentre.com/wordpress/?p=361 , gives a good indication of the place. Have a look at some of the vids, especially their St Patricks’ Day trip to their “twin” restaurant in Barcelona. The cool laid back atmosphere was evident as we moved up the stairs to the first floor room. It takes about fifty and is very well lit by the string of large windows to the east and north. From my seat, I could see the City Hall, the Clarion Hotel block, the river in between and the “heights” of Montenotte in the distance. We were first in but it soon filled up to the limit. After a friendly welcome, we were given the photo-copied menu. It was originally handwritten, squashed into the page with some quirky bits of shorthand e.g. cous2 for couscous and humour e.g. “You wanna tortilla y salsa with your guacamole mister” include in the description of the peppered port beagle shark. Had been expecting to see a big dash of Spanish or Catalan in it but there wasn't much and, in any case, the friendly men on duty were very helpful indeed. One or other would come to the table, maybe pull over a chair, and give you all the explanations you needed. All the starters are €9.50 – it is quite expensive. My Lamb’s Liver Sautee with red lentils and porto was absolutely superb while my advisor was delighted with her Goat’s Cheese and Chard Tartlet with a beetroot sauce. These were fairly substantial, more or less equal to what you might get on a lunch plate in a cafe. The waiter, with some pleasure, noted the empty plates and, swelled by the vote of confidence, marched off for the mains. There was no stopping us now. I went for the Hanger Steak (€21.50), exceedingly flavoursome, the menu promised, with a puttanesca (Ladies of the night, I’m told) sauce and frites. Lots of meat, they said. And there was. And it was flavoursome. Great stuff. And a very popular order at other tables. The other mains was Silver Gurnard (€23.15), with organic greenery, ovened potato and a ramson (wild garlic) and sorrel crème. The gurnard is apparently plentiful around the Irish coast but the Silk Purse say you have to get to the markets early to get your hands on it. It is certainly worth it, a marvellous dish. Again the compliments flew: “The best fish dish I have ever had.” Amazingly, I have never seen gurnard on any other menu in Cork. Is the guy from the Purse buying it all up? Other starters included: Red Mullet chilli-chilli, Fried haloumi, Revuelto de chorizo y pimentos, Kafkas, stir fried squid while mains included Peppered shark, spring lamb and potato gnocchi. Desserts were rather limited though the chocolate cake we shared, which included elements of orange and rhubarb and truffle, and served with a little cream, was fine. The only other dessert was a cheese selection. But the mains and starters are the stars here. You don't get a wine list as such but there are six or seven of both red and white on the blackboard. Some are cheaper but most are €7.50 a glass or €30.00 per bottle. I had the New Zealand Paper Road Pinot Noir with my starter and the Diva Shiraz with the steak. Both were good but I did prefer the Pinot and it is a grape that I intend to follow. The advisor was very happy with the Pinot Grigio. So happy all round then. May have been expensive but we had a lovely couple of hours and felt we got value for money. Oh yes, we were gone by nine, just! The Silk Purse is open three nights weekly (Thurs-Sat); otherwise their food is available in the Crúibín Bar downstairs where you may also enjoy some local beers, aside from the usual big brewery brands. What’s On Offer In Restaurants? Devised by the Restaurants Association of Ireland ‘Dine In Cork-Restaurant Week’ will see over 40 of the city’s top restaurants offering a special promotional rate of €25 per person for traditional three course dinner menus with tea and coffee – representing a 20% saving on traditional prices! From 7.00pm each evening customers will be presented with a three course special ‘Dine in Cork’ menu. Quick trip through the English Market this morning. Called to Iago and bought some Hegarty’s Cheddar and then on to the ABC, a regular stop, to get a seeded brown baguette. Lunch sorted! Been a while since I called to Iago but entry from Oliver Plunkett Street made up my mind for me. The helpful assistant sliced the mature cheddar as ordered and then wrapped it nicely in the waxed paper. If you get cheese there, don't throw that waxed paper, unless you know everything about cheese. They have loads of helpful info printed around the paper and it is certainly worth a read! Met Joy from Joy’s Jams at the Ballincollig Farmers Market recently. She makes quite a range of jams but it was the marmalade that I was interested in. I was looking for what we used to call thick-cut and Joy told me that I was one “of the ten per cent”. She didn’t have any but offered me a nice looking Seville orange marmalade where the peel had been pulped along with the fruit. I’m trying it out at the moment and it is very enjoyable indeed but the ten per cent are stubborn and I do prefer the product from Nash 19 that has much the same darkish colour but has loads of tasty peel all through. So Nash 19 takes the honours with Joy’s Jam in second. Other recommended marmalades are Bramley Lodge and Follains. Barry’s Tea was founded over a hundred years ago. Now, in 2010, they crank up the health credentials with two new additions to its tea family, Pu-erh and South African Rooibos. With Pu-erh rich in anitoxidants and South African Rooibos naturally caffeine-free these high quality teas are an exotic, healthy alternative to traditional blends. To celebrate these new additions to the traditional family, we have a really nice Barry’s Tea Speciality gift box as a prize for our email quiz. Made using the finest ingredients, Barry’s Pu-erh Tea, which has a very pronounced earthy aroma and taste, is blended from a variety of the tea plant Camellia Sinensis and takes its name from Pu'er county near Simao, Yunnan, China. Rich in antioxidants, there has been a growing demand for Pu-erh in the Irish Market as it is widely recognised for its varied health benefits and is claimed to aid digestion and reduce blood cholesterol. Answering Ireland’s call with this new blend, Barry’s Tea has crafted it’s Pu-erh Tea to appeal specifically to Irish pallets. Made from 100% Rooibos, a herb sourced in the Cederberg mountain region of South Africa,Rooibos literally translates to Red Bush, which it is also known as. Being a herb Rooibos is naturally caffeine free howeverunlike most herbal teas Rooibos can be enjoyed with milk, similar to traditional black tea. Naturally low in tannin, Barry’s Rooibos is a deliciously aromatic tea, the ideal alternative to Black Tea. Main Range: Gold Blend; Classic Blend; Original Blend and Decaf. Green Tea: Organic Green Tea; Lemongrass infused Green Tea and Jasmine infused Green Tea. Barry’s Tea was founded in 1901. Where was their first retail shop? (A) Patrick Street (B) Prince's Street (C) Bridge Street? In the event of a tie, all correct entries will go into the hat and the winner will be drawn. Email your answer please to cork.billy@gmail.com before May 1st. Our guided tour to the Jameson Experience in Midleton started unusually – with a fire drill. It finished, as usual, with a tasting, and then the conversations started between the Germans, the Irish, the Americans, the French and the rest! A drink of the popular Irish whiskey is included in your ticket but you can also volunteer, like I did, for the tasting. That consists of sampling three different whiskeys: Scotch, Jameson and American. At the end you get a certificate of competence if you guess the right answer, which is Jameson, of course! All good fun. The Old Distillery in Midleton ceased production in 1975 after 150 years of production and the Jameson Experience was opened to the public in 1992. The tour takes you through the history and you see the world’s largest Pot Still, an impressive and still working 160 year old Water Wheel and the original distillery buildings. After your tasting, you may linger in the bar, check the souvenir ship or have a meal at the Malt House Restaurant. All in all, quite an interesting tour but remember the fire drill is not guaranteed. By the way, production continues in the new distillery on an adjacent site. Raymond’s Restaurant, situated on the road into the well known Jameson Experience, was the venue for lunch today. Great reception from eh staff and, more importantly, we had a terrific meal. Started off with a fine mushroom soup, the real thing, served with decent bread. Main course (€14.50) was a combination of hake and an herbed John Dory, with a Lemon Hollandaise sauce. The fish was very well cooked indeed as were the accompanying vegetables, giving us a very pleasing top notch combination, which went down well with a glass of Sauvignon Chardonnay (€5.00). We were out for the day, so dessert was ordered. I thoroughly enjoyed my date and butterscotch pudding and the seasonal fruit roulade was also excellent. Two cups of coffee finished off a lovely relaxed meal. It was very well done indeed and I would have no hesitation in heading there for an evening meal. Restaurants who will be taking part in the Dine in Cork event, starting April 30th, are: The Rising Tide, The Cornstore, Greenes Restaurant, Jolas Restaurant Kinsale, Clancy's, Jacques, Isaacs Restaurant, Club Brasserie, Fenn's Quay, Boardwalk, Captains Table at the Flying Enterprise, Over the Moon in Skibbereen, Eleven West in Cobh, Cafe Mexicano, Eco Douglas, Jim Edwards Kinsale, Amicus Paul St, Amicus Douglas and Ambassador Cook St.
Seared Tuna Salad (9.95 /14.95) - A salad of Jersey royals, purple sprouting broccoli and young plum tomatoes in mint vinaigrette topped with seared line-caught yellow fin tuna is among the tempting dishes on the Liberty Grill new April menus. Good luck to everyone involved in the Waterford Festival of Food this weekend, based in Dungarvan and West Waterford. Good Eating! Match food and wine. Check out what Karwig Wines have to say! Tempted by the reviews on the six course tasting menu at Augustine’s, now located in the Clarion Hotel (right of photo), we headed for Lapp’s Quay last evening. In quantity, the six courses would probably equal that of your normal three course meal. But as regards quality, this was something else and worth the 25 euro even if the free glass of wine is no longer available. Started off with the little glass of Spicy Tomato Consommé. This cold opener was served with some handmade breads, a delicious crispy brown along with a novel and very tasty tomato and fennel. perfection, full of taste, generally gorgeous. Then came a bowl with something white in the base. The waiter spotted the puzzlement and quickly said ‘just a second’ before filling the cavity with a Wild Mushroom and Truffle Soup. The something white, by the way, was Parmesan Crisp. Delightful. Now for the Assiette (plate of pork). Well, it was actually a slate (like they use in Les Gourmandises) and on it were scattered rillette of pork and crackling, Confit pork, an apple membreo and parsnip purée. A smashing combination and more substantial that you’d think at first glance. Then came the cheese course. Just one piece of cheese with a cooked plum. But that cheese was Bleu de Bresse, a pungent cows milk cheese from the same area where the famous AOC Poulet de Bresse comes from. Again, the cheese and the plum were brilliant together providing a few very tasty mouthfuls indeed. The only snag here is that not everyone would eat that type of cheese because of its patches of blue mould. The finale was a selection of desserts. We had a beautiful Fruit Jelly and a lively Crème Brûlée. The only bum note of the evening was the Bread and Butter Pudding, mainly because of the introduction of chocolate which didn't work for us. Wine was a sharp refreshing zesty Julio Buchon Sauvignon Blanc (Chile 2009), cost €25.00 per bottle. All in all, it was quite a meal, a very enjoyable experience, in no small measure due to the excellent service. Highly recommended. Sunday April 25th – 9.00pm is the date and the time for twebt4 to cork off. The Twitter wine event, a blind tasting, was started by a bunch of Cork enthusiasts but has spread throughout the land and O’Brien’s are the official supplier for the fun event on Sunday week. You may buy the mystery bottle from their site or in their shops in Beacon South Quarter, Donnybrook, Limerick and Galway or you can even contact them and buy it in one of their other shops! If you can't make the shops, the bottle will, as usual, be available to order and the delivery charge is just €4.00. Met Frank from the Fermoy Natural Cheese Company at the Cork Good Food Week and meant to get around to their products before now. The small company is found in Strawhall, Fermoy and makes Raw Cows Milk Specialty Cheese. Frank and Gudrun Shinnick are members of Good Food Ireland and CAIS (Irish Farmhouse Cheesemakers Association). They make five different cheeses: Cais Dubh, Cais Rua, Saint Brigid, Saint Gall and Hibernian. Hibernian is not easy to find but the others can be bought at the farmers markets (at Mark Hosford's stalls) and at the Pig’s Back in the English Market. Nash 19 also use them in their restaurant. And indeed it was Mairéad from Nash 19 that directed me over to the Pig’s Back where I bought a wedge of St Gall. This is a hard Swiss type cheese and was certainly a hit in our house and I immediately added it to my short list of favourites. St Brigid didn't go down as well – let’s say we had a disagreement. It is a semi-hard smeared ripened cheese and, though described as mild, is somewhat more pungent than St Gall. I certainly didn't find it overpowering, or anywhere near it, and would love to have it on my plate at anytime. Still, if forced to make a choice I would go for the five and a half star St Gall. The Gudruns are an award winning couple as they picked up a Gold Medal double in the 2008 World Cheese Awards. The cheese is made from the milk of their pedigree Friesians who graze in the fertile valley of the Blackwater. Now for the Cais Dubh and the Cais Rua! The Good Food Shop is a regular call when I’m in the English Market. The stock and variety here is huge, everything from organic chocolate to smoked duck. Today I was on the lookout for coffee and found a selection, both of type and sizes. In the end, I settled for an organic Italian Roast and Ground with a promise of “dark, rich and gorgeous”. Cost of 227 gms of this Fairtrade (Equal Exchange) product was €4.94. I’ve always found the staff here helpful and courteous and indeed knowledgeable, as one often has to request the location of a product in the narrow aisles of the shop. Today I found the coffee myself and the till service was friendly. Funnily enough, I’ve never been able to find the Good Food Shop on the list of stalls on the market website at http://www.corkenglishmarket.ie/ Checked again today, no change. Mystery! Visited the Bulman in Kinsale (Summercove, near Charlesfort) for lunch yesterday (photo) and left a happy customer. The harbourside bar, you park by the water, looked well in the sunshine yesterday. Still, just in case, a fire provided heat indoors where, unusually for Ireland, a large dog slept under a table as his minders dined. The relatively new owners have give the place a revamp but the maritime theme is retained and now the restaurant upstairs is called Toddies and from there you have a fine view out over the harbour. The view downstairs is more restricted. We ate downstairs in the bar and I went for the specials. Started with the Fennell Soup (€4.80). Accompanied by some nice bread, it was warm and well seasoned and very tasty indeed. Then came a gorgeous little plateful: ham and smoked Gubbeen on ciabatta. Everything here was just perfect. The ham was the real deal and it and the tomatoes went very well with the delicious West Cork cheese and the whole thing was done to perfection. Cost €8.50. Service was friendly and efficient. All in all, it was a lovely stop. If they can do the small things this well, then I’d have no qualms about driving down to Toddies for dinner some summer evening. O’Crualaoi Butchers have been trading since 1957 and new shops in Fermoy, Carrigaline and Wilton have seen a rapid expansion in recent times. Ballincollig is their first shop and I called to see their set-up recently. Here there are two sections, an inviting delicatessen and a very impressive and well laid out butcher shop. Wasn’t on a meat buying mission on this occasion but did pick up a few things from the deli, including one of their fresh soups (mushroom). It was an excellent soup, very tasty indeed. Much of that taste though came from the cream and butter in the mix. If you want something healthier you could try the recipe below which comes from an old Irish Heart Foundation leaflet. ½ lb mushrooms, finely chopped. Chopped parsley, to garnish; salt & pepper and juice of half a lemon. Method: Place all ingredients, except lemon juice into a large saucepan; whisking continuously over moderate heat, bring to the boil, cover and simmer for 10 minutes. Just before serving add lemon juice and stir well. Serve sprinkled with chopped parsley. 1- My preference is to use low fat rather than skimmed milk. 4- You could add a swirl of Crème fraiche with the parsley. There are yoghurts and then there are yoghurts from Glenilen Farm. Wow! I have to admit that I have just discovered these little jars of gorgeousness. All other yoghurts fall away by comparison. If you haven't had the pleasure get on to their site http://blog.glenilen.com/ and check for your local stockists. I found mine in O’Crualaoi’s delicatessen section in the Supervalu building on Main Street Ballincollig and it wasn't long before I was trying out the strawberry flavoured one and declaring it the best ever. But don't just take my word for it. 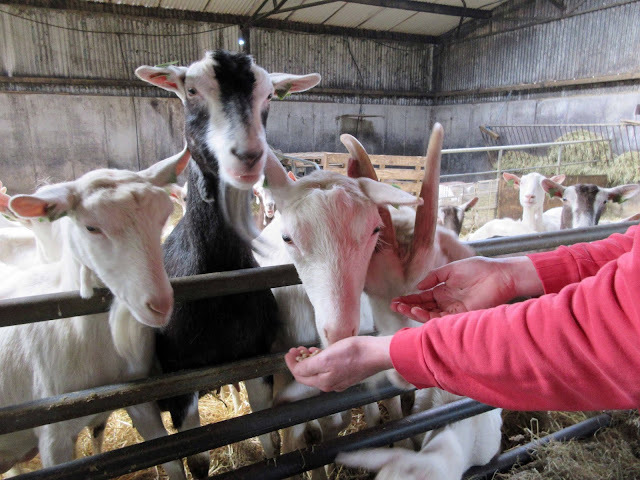 The success story of Glenilen Farm (in Drimoleague in West Cork) started with a small step in 1997. And the success has been marked with prizes, both national and international. The range now includes cheesecakes, yoghurts (small and large), various creams, butter and mousses. A lot of exploring to do here. But it will be no hardship! Today Nash 19 are getting a delivery of local, organic Rhubarb from Waterfall farms, and some free range eggs from Kinsale. Kevin At Fenns Quay was talking to an American customer about beef stroganoff. “Interestingly it's usually served with noodles in the states, not rice.” Best stroganoff I’ve ever had was on the shores of Lake Wolfgang in Austria, alongside the famous White Horse Inn. It was the main course in my Sunday lunch and, in 2004, cost me six euro and, yes, it was served with rice. Called to the Ballincollig Farmers Market this Wednesday morning. It is nicely located in the lanes of the new shopping centre but is fairly limited, not very many stalls, at least on this occasion. Had a lively conversation with Joy O’Driscoll of Joy’s Jams, mainly about her marmalades, and ending up buying a jar of her gooseberry (€3.50) and a jar of her dark Seville Marmalade (€3.80). Next call was to the Tom’s Bread. We’ve been coming across them lately (previously in the Coal Quay and also, via ABC, in the English Market). This time bought a lovely baked wheat bread (€3.90) with a scattering of hazelnuts surprising the taste buds every now and then. Very enjoyable. Kept circulating and helped ourselves to some decent looking carrots from the farmer’s stall, avoided the highly visual temptation of Katie’s Cup Cakes and some hot food stalls, including a creperie, before buying a couple of herb plants at €2.00 each from the helpful man at Swanton’s Stand, a stand seen regularly in their home base of Skibbereen where the market, much bigger than Ballincollig’s, take place every Saturday morning. Fenn’s Quay is well known for the quality of its food but today I start by praising its wine. Kevin Crowley knows his and puts in a big effort to provide his customers with quality and value when it comes to having a drink with a meal. Last evening, we choose a Chilean Viu Manent Malbec to go with our Ossa Bucco (braised beef in this case). Delighted with it and, in the low 20s, it was good value as were the recent reds there, which included Cave de Tain Syrah VDP 2006 (from the Rhone Valley and now the house red) and previously the Spanish Bodegas Castano Monastrell 2007 Yecla and that is just to name a few off the lower end of a very impressive list indeed. We started off last evening with a tomato and roast pepper soup. The Braised Beef shin was accompanied by a tomato and red wine sauce. It smelled good as it came to the table and was just gorgeous, falling away from the bone and just like your granny (your Irish granny) used to make it. Desserts were excellent, both specials. I had an almond tart under a juicy mound of strawberries and the other dessert was a well done Bread and Butter Pudding. I mentioned specials there. The website does show the regular meals but the choice here is much bigger, with specials added every evening to both the Supper (27.50 for 3 courses) and the a al carte Menus. Once again, another enjoyable evening at Fenn’s Quay. Atmosphere is always nice and relaxed and the service friendly and efficient. Highly Recommended: Aherne’s (Youghal), Fenn’s Quay, Liberty Grill, Nash 19, Over the Moon (Skibbereen) and The Continental. Recommended: Boardwalk Bar & Grill, Bramley Lodge, Crawford Gallery Cafe, Farmgate (English Market), Gilbert’s (Cobh), Hardwood and La Jolie Brise (Baltimore). Really Good Food Shops: Bramley Lodge, Nash 19, Le Gourmet (Youghal) and O’Keeffe’s (St Luke’s). Best Food Producer: Just Food (Cobh). Coffee/Tea and Scones: Cafe Gusto, Greene’s, Hawthorn on the Lough, Nash 19 and Wholy Grain. Top Cheeses: Kilmichael Soft Cheese from the Sunview Goats; St Gall (Fermoy); Milleens. It was very quiet in Ballydehob on Saturday afternoon. “Most of them are away enjoying the sunshine,” said one of the locals. We were beginning to doubt we’d get as much as a cup of coffee when we spotted the Bridgestone be-decked front wall of Hudson’s Wholefoods. Between meals at the time, we didn't really study the foods in the shop but could see that there was quite a range. Went to the little cafe at the back where we got our two fine black coffees from the smiling waitress. Looks likes something of a community information centre as well with loads of leaflets and cards on alternative services in the area. Enjoyed a bit of down to earth banter (about coffee fashions) as we paid up and headed off into the sun, resisting (barely) the temptation to sit down again after we’d spotted – too late – the sign for organic wine at a fiver a glass!